My life has been forever changed — and thankfully, so has Edison's. Everywhere I turned in Ecuador there were kids, but it wasn't until we visited the last project that I saw — correction — heard so many babies. When we arrived at Project #EC-121, we were led into a small room that served as a sanctuary full of hundreds of moms with children under the age of 3. They're part of Compassion's Child Survivor Program, and something about the program was very special to me. My household has two small children — a four year-old girl and a 20 month-old boy, so we hear lots of crying and go through plenty of diapers. Raising small children is rewarding but can be very trying; and as I looked around the room, many of these women appeared to share the same universal joys and struggles of raising children that my wife and I do. Throughout the day, I shared with them photos of my family and we often smiled together in a mutual understanding that required no translation (which was good because my Spanish is pretty bad). But there was a distinct difference. Most of these women were single mothers, often raising 2, 3 or more children by themselves with very little to no income. We were told that before these mothers enter the program, it's not uncommon to see a 60% rate of women who have thoughts of suicide. 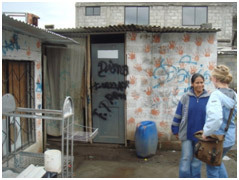 The child mortality rate is high, 4-5% in this area of Ecuador. However, the Child Survival Program is changing that. By educating mothers in areas such as hygiene, nutrition, developmental skills (for both mom and baby) and by providing routine medical treatment along with nutritious meals for both the mother and child, the CSP program is making huge strides in the lives of these families. The babies show incredible signs of improvement and are much further along developmentally when compared to other 3 year olds who are part of the traditional Child Sponsorship Program. It was also exciting to see that the mothers are learning new skills to help them earn income for their families. 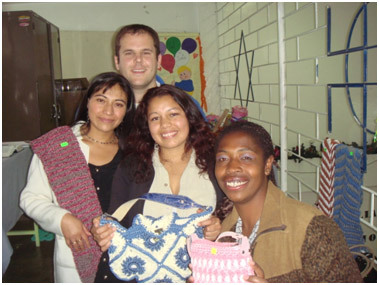 I met three of the mothers and was excited to buy their wares (it was the first "sale" for two of them) since my wife is an artisan, too. But one of the key characteristics of the CSP program happens through the home visits done by the "promoters" — volunteers who visit 8 moms each day and spend an hour with them every week to counsel with them and help their children with developmental exercises. That afternoon, we went on such a visit to see Edison and his mother. They live in what could best be described as the gates of a dump. 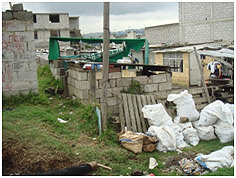 It's a place where people sort through trash to extract recyclables and other valuables that they could sell. 25 people share a single outhouse. Nine of us gathered into the house—a 10'x10' room with two twin beds and a refrigerator. There were no windows, and the door was a sheet. Almost all of the people we had met on the trip were incredibly joyful, but Edison's mother looked defeated. We learned she had 4 children living with her, and Edison was constantly sick. Thankfully, because of the program, great strides were being made to improve his health, but she still looked as though the weight of the world was on her shoulders. Words, pictures, and even video can't describe the moment. Edison was just two months younger than my son. Suddenly, it all became very real to me. Now I know. Now I know that poverty is real. I know that there are kids — just like my kids — who live at the dump. I no longer have to imagine it. I've seen it. But I also know that in the name of Jesus, many of these kids are being lifted out of poverty. It gives them hope, and it gives me hope. In fact, one of the only things that gave me solace in that situation was that Edison and her mother were part of a program that not only was helping him grow but was showing him the love of Jesus. Edison and her mother were getting nutritious meals, fellowship with other moms, and one-on-one developmental counseling thanks to Compassion International. ...there are kids — just like my kids — who live at the dump. 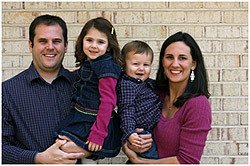 "From Surviving to Thriving" by Ben Steed is licensed under a Creative Commons License. Heartlight encourages you to share this material with others in church bulletins, personal emails, and other non-commercial uses. Please see our Usage Guidelines for more information.